Remember the olden days when comedy clubs with a two-drink minimum policy ruled? That era is long gone, but this venerable laugh factory has managed to hang on. The comedy here is a bit of a mixed bag. 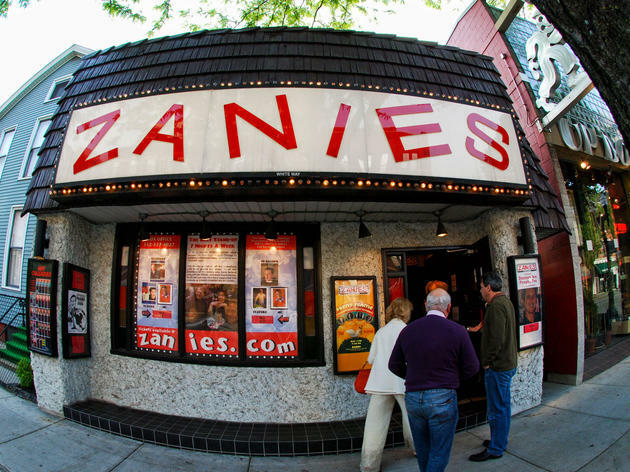 On the one hand, Zanies offers stage time to up-and-comers while paying tribute to some of the greats, but both the venue and the comics can, at other times, feel a bit dusty. El stop: Brown, Purple (rush hrs) to Sedgwick. Bus info: 11, 22, 36, 72, 156. I recently attended a comedy showcase at Zanies and had a great time. Yes, the show itself was great, but I won't review that part since it was a one-time only show. Other than the funny show, I was pleased with the attentiveness of wait staff (without being disruptive) and the pricing of drinks was comparable to other venues. I didn't care for the seating arrangement much though: I sat at a row of two-top tables that were really close together and didn't face front to the stage. As a result I was staring directly into the woman sitting next to me and had trouble seeing the performer. My neighbor often threw her head back laughing (good!) and then her hair wound up in my face (not so good for me). Not all tables were set up in that fashion, but I'd recommend taking a different seat if you can manage it.